When a multi-day event is currently happening (spanning the current day), the event aggregator records the event as starting on the day it should end. Create a Google calendar with a multi-day all-day event starting yesterday and ending tomorrow. The preview should show the event beginning yesterday and ending tomorrow. The imported event should begin yesterday and end tomorrow. The preview shows the event beginning tomorrow and ending two days after tomorrow. The imported event begins tomorrow and ends two days after tomorrow. Thanks so much for reaching out and for providing us with such detailed steps to follow! By default, Google Calendar will import events from today as a start date, which is why the multi-day event defaulted to today, rather than yesterday. To change this, you can refine the import to start yesterday. This will then shift the dates of the event to the correct dates. Please review the bug description a little more carefully – especially the description of the actual results. It’s not merely missing the past days on the import; it’s getting both the start and end date completely wrong. It is using the end date as if it were the start date, yet the duration of the event remains the same, pushing the end date far into the future. 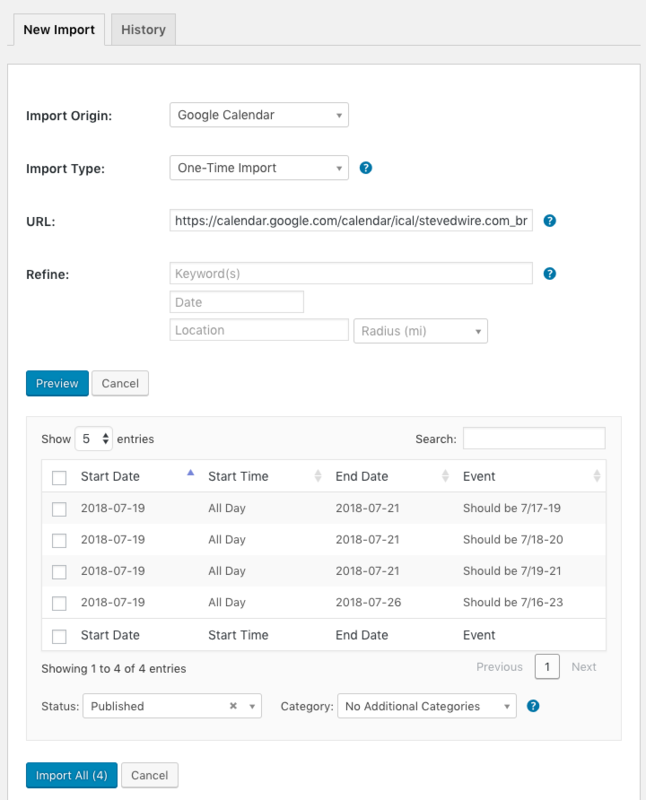 The point is, if the start of the import is after a multi-day event begins but before it ends, then the dates of the imported event are wrong. This is still a defect that needs to be fixed and cannot be worked around simply by changing the default start date of the import. Thank you for your explanation. Would you mind taking some screenshots of your event in your Google Calendar and how it appears in your import and preview, so that I can ensure that I fully understand the issue? Let me know if you have any other questions in the meantime! Here’s a sample of my test calendar. It seems that regardless of what day the multi-day event is supposed to start, the aggregator shifts it to start tomorrow if the event has already begun at the time of the import. And the duration of the event remains the same, pushing out the end date to be incorrect as well. I’m sorry to hear you are experiencing this problem. Unfortunately, I could reproduce the same issue on my end. I have logged a bug report for this so it can be addressed in one of our next maintenance releases of our plugins. I will set this thread’s status as “Pending fix” and link it to the report. This way, we will notify you once a fix is released. We apologize for the inconvenience and we appreciate your patience while we work on this. Please let me know if you have any other questions in the meantime! Just wanted to let you know that we’ve just released a fix on our Event Aggregator server to address this issue. There is no need to update anything on your end, but do make sure you are using the latest versions of The Events Calendar. We apologize for the inconvenience and we appreciate your patience while we worked on this. Please try your imports again and let us know if they work on your end.